The Engineer’s Baby’s first birthday was more than two weeks ago now, but we’ve been busy with various things, and I’ve been struggling to process all the feelings, so this letter is happening now. Better late than never, I say. You are now officially one year old. And what a year it has been. It has been joyful, and hard, and surprising, and amazing, and tiring. We are both learning about each other, about the world. Of course, we haven’t always been right in sync. There are times where our needs have butted heads like I never imagined. But we’ve both come out the other end relatively healthy and happy, so I’m calling it a success. When you were born, you were big and cuddly, and strong. You took a little time and encouragement, but then came rushing into the world with gusto. And these patterns from your earliest days have continued to appear again and again throughout the year. At one month you were smiling and staring and loved nothing more than your parents. We hadn’t yet figured out what you needed to ease into sleep, and the evenings were fairly loud and uncomfortable. But during the night and day you were a curious wee dot who wowed everyone with those strong legs. At two months you worked out how to roll yourself over so you could see the world from a new angle. You spent most of the time on your tummy (or cuddled into a parent) from then on. At three months you were growing and growing. You were moving through clothing sizes rapidly, were figuring out new things all the time and were starting to move around a little. We were still struggling with sleep, but the evenings were a lot calmer. 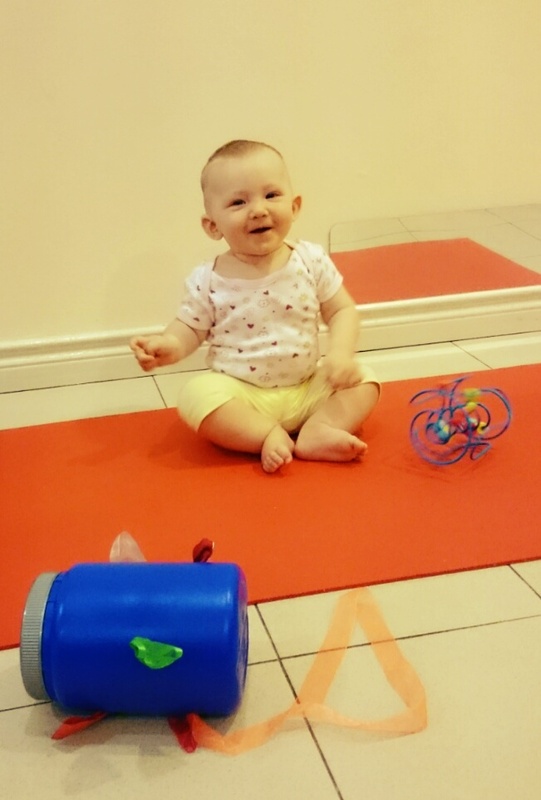 At four months you figured out forward momentum and could commando crawl to what interested you, which revolutionised your play time. I started to feel like I knew what I was doing, and you showed me that I didn’t really (and probably never truly will). 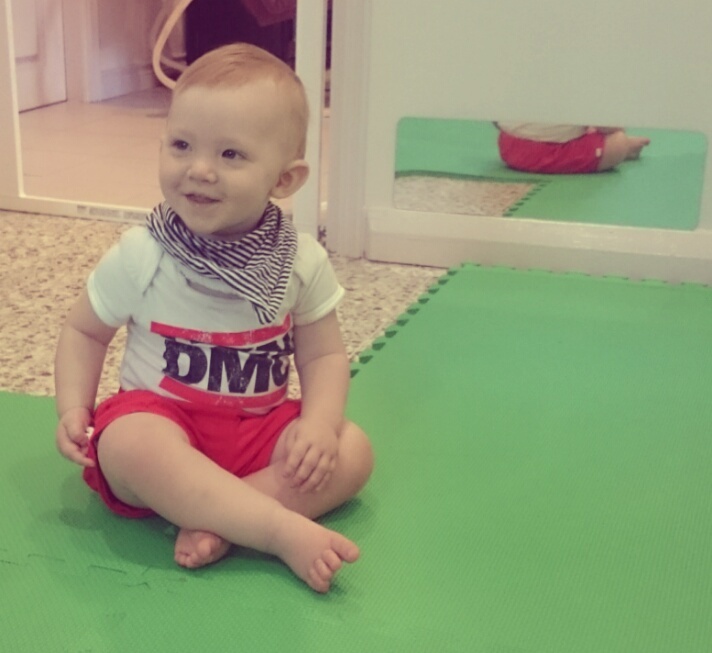 At five months you worked out hands and knees crawling and how to get to a sitting position. You got your first teeth and tried your first foods. We were in New Zealand for most of the month, and came back with a completely different baby. At six months it was hard to keep up with the changes. You were babbling, pulling up to standing, and going through your first bout of separation anxiety and we all caught more than one virus. I was tired and overwhelmed and it was a rough month. But we survived. At seven months we made some changes to your sleep habits, and we all got a bit more sleep, at least temporarily. You took your first cruising steps, and continued to surprise everyone with your movement. At eight months you finally gave up the carrier for your naps (with a little bit of encouragement from us. Or quite a lot of encouragement…) You continued to get faster at cruising around, started to let go a little, and got a whole lot more teeth. At nine months you could stand on your own. You also started to clap and wave, and were losing some of your babyness. It was amazing to watch, but we definitely had mixed emotions about how very fast you were growing. 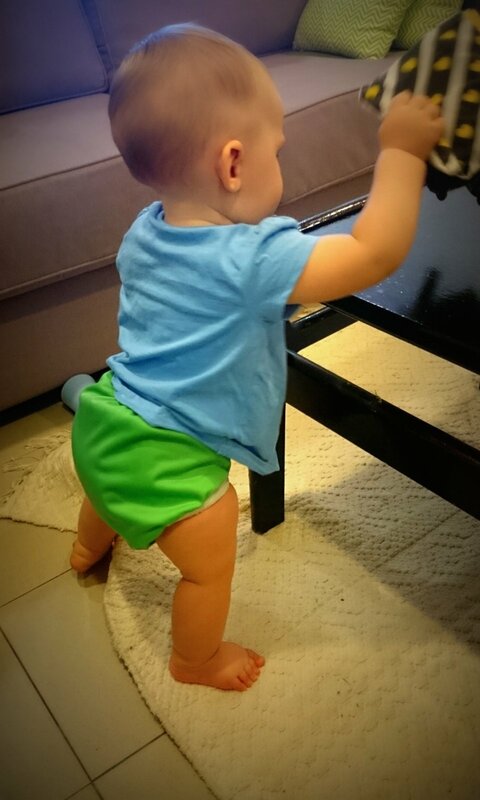 At ten months you took your first wee steps. We were so excited and proud, and you seemed to think it was no big deal at all. You slowly grew in confidence and walked further and further. 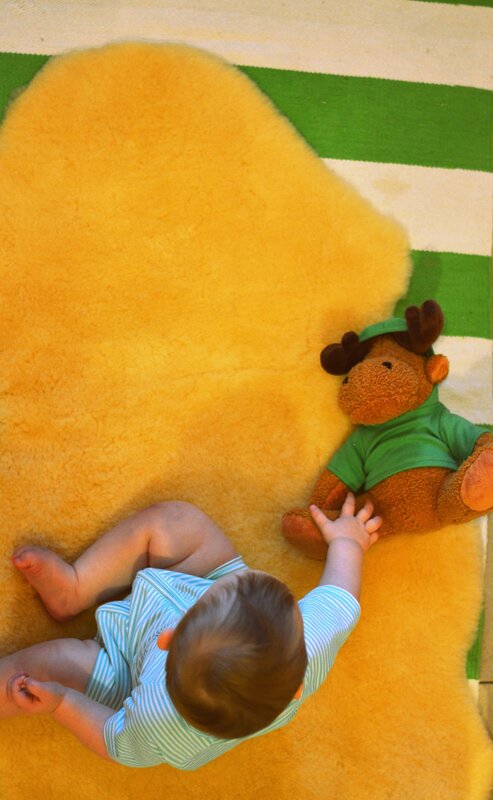 At eleven months you were walking more than crawling, and were starting to talk. Your words weren’t English, but were adorable. Combined with a lot more pointing, you were able to communicate more and more every day. Your favourite thing was to stare out the window and watch the birds. 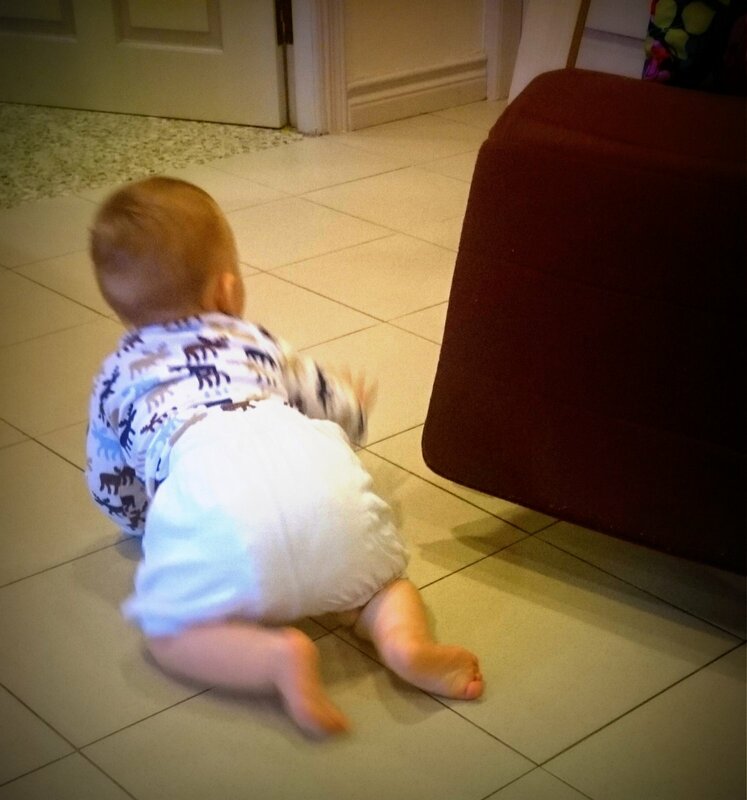 And now, at twelve months you are just starting to run (or at least you want to!) You’re a real little kid, and an amazing kid at that. You love to wander around outside, and are very good at letting us know when you want a cuddle. You are very serious about your playing, and when we’re out and about. But for your favourite people you always have a smile (and often a present). I share these milestones not because the actual milestones or their timing is important, but to show just how far you have come. But with all that growth and change, you remain the same E underneath. You take a while to warm up to situations, but once you’re confident you go for it. You’re a bold little explorer, but like to have the safety of a parent watching out for you. You’re a scientist, running experiments all the time to figure out the world and your place in it. You’ve got your opinions, and you’re not afraid to show them (loudly if necessary). You are cuddly when you want to be, but are first and foremost an independent wee soul who needs to work everything out for yourself. This has been the most amazing year of my life so far, and I can’t wait to see how you take these things and build on them in the years to come. I haven’t always found it easy to keep up, but together we made it. Happy birthday E. I love you. 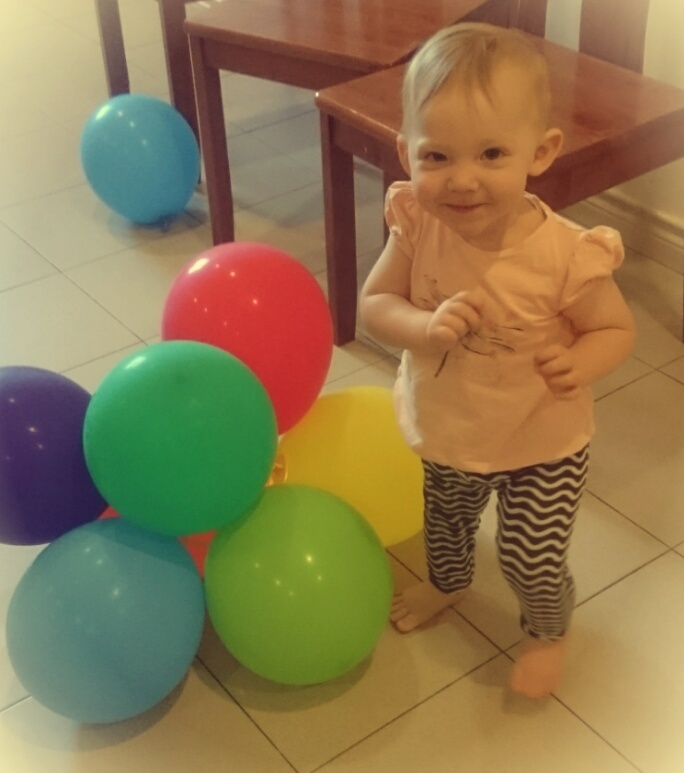 It’s pretty obvious given the title, but this blog is about a baby. A gorgeous and wonderful baby. I think most people reading know at least a few of the details, but for anyone who doesn’t, here’s a quick introduction to the reason we’re all here. 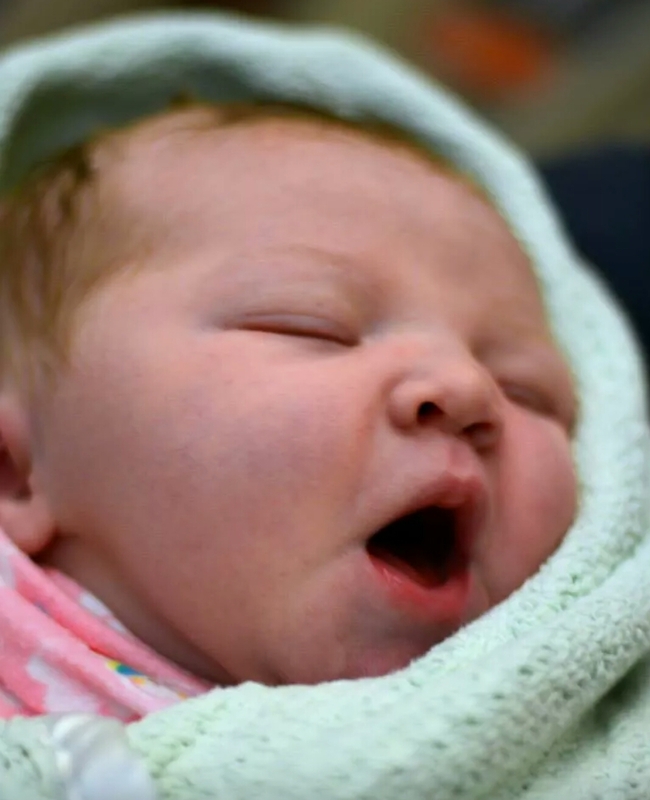 The Engineer’s Baby was born on 18 July 2014 at 5:05pm, weighing in at a sizeable 4.4 kg (9 lb 12 oz). 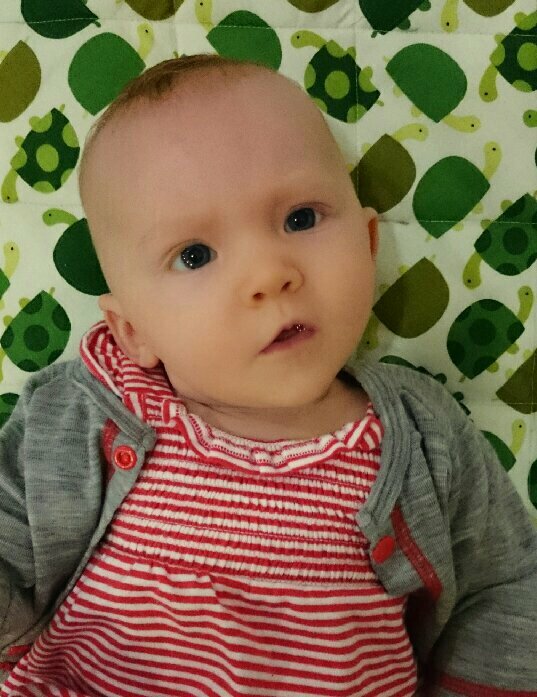 At the time of writing she is 16 weeks old (I had to count that one out; we usually go with three and a half months right now) and weighs an even more sizeable 7.9 kg (17 lb 6 oz). She has the cheekiest wee grin and will usually share it with anyone who smiles at her, but sometimes when she gets a bit tired she’s a little bit shy. 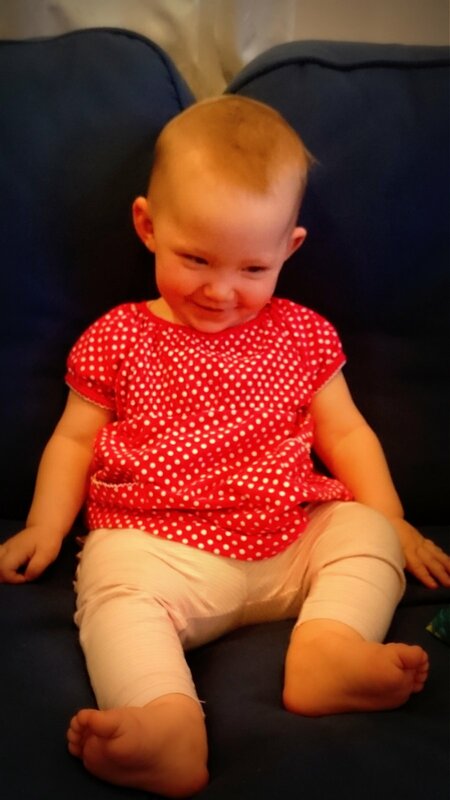 She giggles, mostly when her mum (that would be me…) makes funny noises or blows raspberries on her belly. It’s probably the most amazing sound in the world. She sleeps fairly well at night generally. She still wakes a couple of times for a feed, but goes back to sleep quickly and no longer likes to party at 3am (long may that continue, we say!) During the day it’s a little bit more challenging – she’s curious and seems to think sleep is rather boring. But popping her in a carrier and walking or bouncing is still a fairly foolproof method of convincing her to nod off. Her favourite toys include a black and white book that crinkles, a giraffe/zebra toy with plastic rings that rattle together on the feet, and a ball with a rattle inside. But she’ll bypass all of those if there are some fabrics that she can bunch together and chew and drool on. She also loves to chew and drool on hands (hers or ours) and stare in the mirror. She is just finding her feet, and loves to grab them when she’s on the changing table and to stare at them when she’s sitting on a knee. She also likes my feet, especially when those funny orange toenails at the end wriggle around. She is a truly amazing wee thing (or not so wee thing!) and The Engineer and I are pretty damn stoked at the way our genes have combined. We are astounded at how she has grown and changed already, and can’t wait to see what else she has in store.